Give your fresh baked goods the creative presentation they deserve with the Hoffmaster 611100 small white tulip bake cup. To retain the elegant appearance and unbeatable freshness of your cupcakes, muffins, or mini-cheesecakes, these bake cups are made from high-quality greaseproof paper. These bake cups can also be used for instantly adding an up-scale touch to display and serve other non-baked items like caramel apples or chocolate candy. Supper Adorbs! Definitely adds some "class" to the finished product. Cakes comes off super clean and easy. I love the height of the liners. Makes for a bigger cupcake. Totally buying these again. These are my go to cups! They are pretty and durable. I have done many wedding and they always make the cupcake table look so nice. 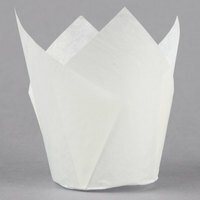 I love these parchment tulip backing cups. I get so many compliments on how awesome and creative our cupcake are! I would highly recommend these to anyone just trying to improve a basic looking cupcake! Loved using these for my lemon cupcakes! Adds the simple, soft look to them. This is one of my favorite styles of liners as they are mess-free and kid friendly. Makes life easy to just pick them out of the pan and place in plastic containers. These are perfect for baking extra large muffins and making them look fancy. I wouldn't switch back to regular liners after using these. Customers always say how great they look. Favorite Cupcake liners. Cupcakes come out super easy, and I love that they lay flat, which makes a sort of eating "plate", which also helps contain the "mess" of eating a cupcake. I have fallen in love with these liners. They are beautiful and sturdy. They are incredibly easy to separate which makes them fast to use. No fighting with stuck liners. Great for weddings or large parties. If you are doing vanilla cupcakes or a light colored batter cupcake these are good otherwise I'm not a fan of them because the darker batters don't look good in the white liners as much as they do in darker liners. They do look fancy and customers love that and that they don't stick to the liner. These are pretty good muffin cups. The only thing I don't like is the steep sides of the cup restrict how much the muffin can rise. A great alternative is Hoffmaster's Lotus baking cups. These are probably my favorite of the hoffmaster tulip standard cups. Any product looks crisp, gourmand, and delicious in white. The material is good, some other are just a bit thinner, this one is right in the middle, perfect. Makes handling cupcakes easy and sanitary too. These are great for when you want to make your muffins or cupcakes look extra special. The paper folds out to make a handy little napkin also! These do not discolor when baking which is also a plus. I love these liners. I’ve been ordering them since I seen them on webstaurant. I love all the different colors. They make my cupcakes look so elegant. These liners are square sheets that are folded into this cup shape. The folds are no sealed down and so the batter leaks into the folds when baking creating an odd shaped top. The folds bake into the cupcake creating a sort of four leaf clover shape. I was not really happy with the way these bake. They do look a little better after you ice them. These are a baking must have! I bake everyday for a coffee shop and these are my go to liner! Really lovely presentation and they hold up very nice. Fantastic price point also! Unfortunately I wasn't too fond of the durability of the these liners. I found them to be rather flimsy. I will be certain to add a second liner. Thank you for your feedback, Tiffany! We are sorry you did not prefer these baking cups, for recommendations please contact our Customer Solutions team! Webstaurant’s baking boxes are white on the outside, and kraft on the inside. You can fold them inside out for a customized look. When I use the white side out, I use the kraft liners inside. When I use the kraft side out, I now have the white liners to use. I think it just helps me tailor different looks without a lot of extra added expense to do so. Just Received these and they are perfect for what I need to sell my cupcakes at my shop! Nicely made, Will buy Again! Great Product! These are the cutest baking cups! My customers love them and they really do make your product more presentable and appealing! Great price and great quality!! I absolutely love these baking cups, they're the only ones I use in my bakery. Customers perceive these to be larger, and the baking cup definitely adds an upscale touch to even more basic cupcakes. These fit in a standard size cupcake pan; when in the pan they seem a bit narrow for the cup but they bake very well. The high sides also make it easier to remove cupcakes from the pan, I simply grab them by opposite corners and lift out. These are super cute baking cups. I used them for wedding and everyone loved them! The guests loved how they looked, they said these liners made my cupcakes look more fancy. I recommend these baking cups to everyone! We use these in our cupcake shop for all of our standard size cupcakes. They definitely add some fanciness to the appearance. Its all about presentation, and if you're going to charge premium prices for your product they need to look the part. We also use this cups to bake our jumbo muffins in. It seems like a stretch when you put them in the jumbo pan but they bake nicely. I baked cupcakes in these, they turned a little brown and cupcake stuck a bit. I decided to bake the cupcakes without a liner and set them in the Tulip cup for display. They looked much better on my wedding dessert buffet table. Loving the tulip baking cups I ordered for my business. They hold their shape beautifully and remove easily to enjoy the treat inside. Only downfall is the white ones I ordered were more of a cream color than the bright white I had hoped for. amazing quality love them a lot!!! They were the perfect size for my jumbo cupcakes!!! There was no oil transfer through the paper as well. Hoffmaster 611100 2" x 3 1/2" White Tulip Baking Cups - 250 / Pack- excellent product for price. Beautiful display. Makes case look so pretty. I love these liners and so do my customers! They are highly requested and make decorating with sprinkles easy and they catch the stray sprinkles. Pretty and durable. Able to make our muffins and coffee cakes stand out. Even used it for cupcakes to make the wedding display look like a display of flowers! These liners are crucial for a clean, professional presentation. They make handling the cupcakes a breeze. Simply pick up by the base or grab opposite corners to prevent messing up the topping. The liners are also bake well in the oven without browning. Highly recommend. This baking cups are so cute! helps create an upscale presentation. They are great for cupcakes and muffins! The cups are easy to peel off the cake as well. The prize is unbeatable! I would give this 10 stars for looks - these are absolutely gorgeous baking cups! I also love the extended points for ease of removal from muffin tins. The downside - a little more difficult to fill, and i also had some 'unraveling' issues. Operator error - but we tried making individual tiramisu in these liners. Unfortunately, when we tried to pick them up - they unfolded and fell apart. Issue solved by placing them into a paper souffle cup (which was a lovely presentation) - but a word of caution if you're trying to use them as a holder versus a baking cup - I think they almost need to have something baked solid in them like a cupcake or muffin to 'glue' those folds together and give it substance. great for simple fancy simple cupcakes, they wrapper make a large impression and makes you look different from all the others. Also great for mini cheesecakes and muffins. These fit in regular size muffin cups/ cupcake pans but allow the batter to rise for taller muffins/cupcakes. I have to be careful when filling as the tips are so tall. We love these baking cups! We bought these after reading a review that the sales went up 400% for one customer. I can say that people do LOVE their muffins in these little tulip cups! We are placing an order today and will ONLY USE THESE tulip cups for our muffins! Thank you for offering such a wonderful product! These Hoffmaster tulip baking cups are the ONLY baking cup we use. They are greaseproof, non-stick and sized slightly larger than a standard cupcake allowing us to push our unit price higher for increased profitability. This is a very cute way to present you cupcakes. I used to hand make these and now I don't have to. They are just the right thickness and uniform in appearance. I love them! Had to buy these after using the brown ones! Beautiful for a lighter colored cake or muffin batter. I also bake cinnamon rolls in these and the tulip holds in the frosting well. I LOVE these wrappers==not only do they make an awesome presentation but they are the perfect wrapper for my NY crumb cake cupcakes.. They are taller than the average wrapper and hold a good amount of crumbs with out spillage! Step up the presentation of your baked goods with these attractive and affordable white tulip baking cups! Nice for breakfast muffins and even cornbread! Easy to fill!!! What can I say? I absolutely love these baking cups! It makes presentation so pretty! I use these great liners for my homemade Coffee Cakes. These are one of the best cupcake holders i have ever used. They set your cupcakes up to a higher level. Makes them more fancy, and therefore faster selling. They are priced perfectly as well. These are nice, standard sized cupcake liners. You can use these for any occasion from birthdays, special events, weddings and every day use. They did not burn when I baked with them the way some parchment paper does. Side by side sales of our cupcakes in our new tulip cupcake holders from Webstaurant vs our old regular cupcake holders? Hands down 4 to 1! They are easier to handle by staff so no bumped frosting and you can frost all the way to the edge so no exposed cake parts which dry out if left unfrosted. So better handling, better shelf life and faster sales!! !